University of Ohio's Central Chiller Plant is chill because it has to be—it supplies water and emergency power to the university's medical district. 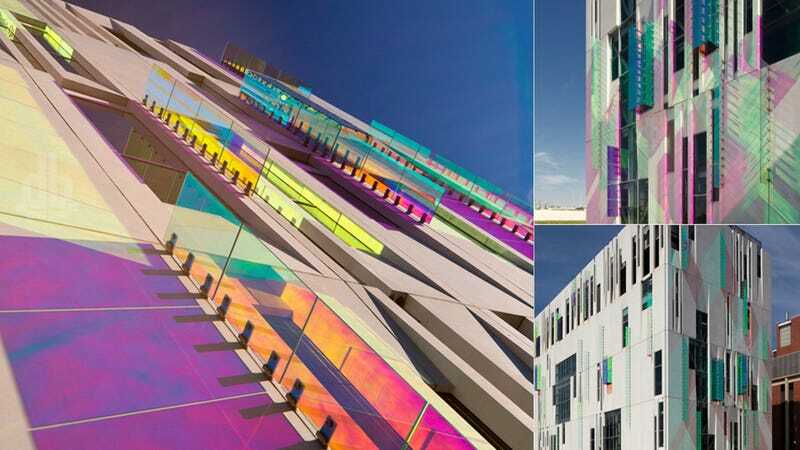 But thanks to its facade covered in prismatic fins, it's also chill in the non-literal sense of the word. Designed by Ross Barney Architects, the plant was created to be both sustainable and durable. But what makes it really remarkable is its facade, which is cloaked in concrete panels with a high sheen satin finish. Between them, colorful little fins made from dichroic glass—which refracts light in colors because of embedded layers of metal and oxides—cast rainbows on the cooling equipment inside.